What does ERS’ “The Sound and the Fury” have to gain from verbatim adaptations? Elevator Repair Service left its mark on Off-Broadway avant-garde theater with its 2012 production of Gatz, an eight-hour long word-for-word theatrical reading of The Great Gatsby. Now, director John Collins has revived a 2008 production (first presented at NYTW, now at The Public) that gives the same treatment to the first section of William Faulkner’s modernist masterpiece, The Sound and the Fury. These 75 pages of text (about two hours of performance) treat us to the wandering thoughts and experiences of Benjamin Compson, a 33-year old mentally disabled man out for a birthday walk with the Compson family servant, Luster. Parts of the his surroundings trigger memories from his life, particularly childhood memories surrounding his two brothers and beloved sister, Caddy. For example, the act of crawling under a broken fence with Luster immediately retrieves a memory of crawling under a fence with Caddy to deliver a letter to a neighbor. Readers of the book have been undoubtedly challenged by its abstract, non-linear storytelling. My own copy, which I re-read before watching the show, is full of highlighted passages, color-coded by chronology and motif, and gloss but Faulkner’s loyal following has love for its difficulty, which, when struggled through, yields raw and pure emotional depth. Whereas Gatz performed Gatsby through the filter of a lonely modern office worker channeling the passions and escapism of the novel, The Sound and the Fury is far less modified. Here, there is hardly any purpose behind the reading of the text. The play hovers between a representation of the action (ie. actors ‘becoming’ the characters) and a distanced reading. 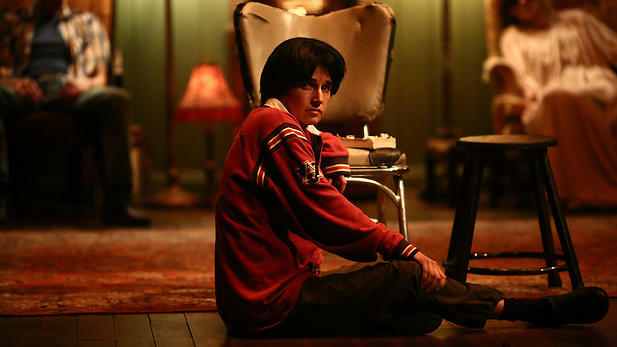 Much of the text is read by actors sitting on couches, vaguely identified in roles, with about as much emotion and nuance as an initial table-read. Susie Sokol plays Benjy for most of the performance and even though it is Benjy’s point of view we are hearing, Sokol doesn’t utter a word. His life is uttered around him by the other characters, The only time Benjy actively participates in an action is when he throws a wildly confused fit or when action is explicitly described in the narration. Even his hollering, which in the text is often pointed out by other characters rather than Benjy himself, is an audio track. The decision to render Benjy passive is a choice in keeping with a faithful rendering of the book. After all, we can only tell where Benjy is and what he is doing by the spoken observations of other characters. Benjy is not a participant in his own life, nor should he be one on the stage. This extraordinary faithfulness to the book, however, doesn’t make for great theatrical performance. There is little to invest in this almost unfiltered rendition of the book. The actors aren’t concerned with portraying the characters in a typically theatrical sense; they are more passing figures on stage equally detached from the text as the audience. Anyone unfamiliar with the plot in advance will have trouble following it here, despite ERS’s decision to open the play with projected explanations of the characters and their relationships to each other. The advantage of reading a physical copy of the book is the ability to reread, annotate, and work through its difficulty at your own pace. Modernism is about interruption, about making one pause to evaluate things one has previously taken for granted and see them in a newly perceived sense through radicalism stylistic departures. Read on stage, Faulkner’s text loses it potency to awe and radicalize perception because our control over it is handed over to the company. Perhaps this dynamic between reading a text and hearing/watching it read aloud is precisely what ERS is asking us to uncover. While the question is a worthwhile one, I’m not convinced that this particular treatment of text is. 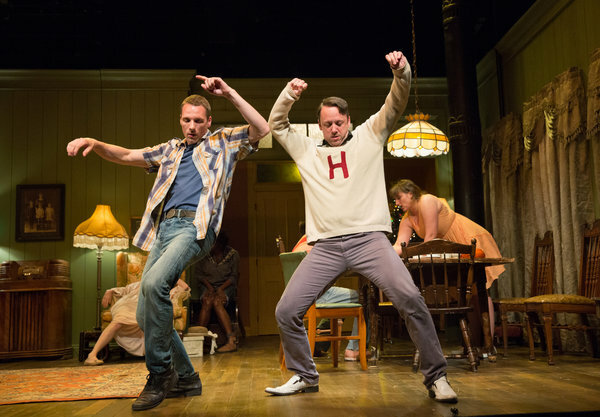 The Sound and the Fury plays at The Public Theater through June 27th. y después empezar a instalar Triviador en el celular con Android. cosas que le dictan los profetas.